Congratulations to Texas Woman’s University Alumna, Sheryl Anaya, for being selected by Cohn Drennan Gallery for the Rising Star 3 Exhibition. An opening reception will be held September 26, 2015 from 7:00 PM – 9:00 PM. 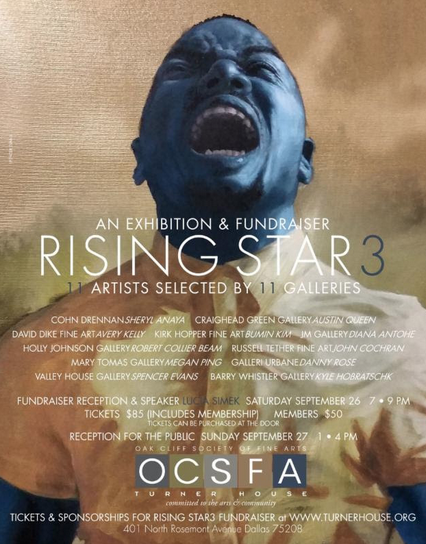 Turner House, (the Oak Cliff Society of Fine Arts) will launch its third Rising Star exhibition and fundraiser September 26th and 27th at the historic Oak Cliff home. Eleven prestigious Dallas galleries have each nominated one emerging Texas artist to be in the show. Participating galleries and artists are: Barry Whistler Gallery (Kyle Hobratschk), Cohn Drennan (Sheryl Anaya), Craighead Green (Austin Queen), David Dike Fine Art (Avery Kelly), Galleri Urbane (Danny Rose), Holly Johnson Gallery (Robert Collier Beam), Kirk Hopper Fine Art (Bumin Kim), JM Gallery (Diana Antohe), Mary Tomás Gallery (Megan Ping), Russell Tether Fine Art (John Cochran), Valley House Gallery and Sculpture Garden (Spencer Evans). A reception will be held Saturday, September 26 from 7pm to 9pm and will include a gallery talk by Lucia Simek, artist, curator, writer, and Manager of Communications at the Nasher Sculpture Center. Ticket prices are $85 per person ($50 for Oak Cliff Society of Fine Arts members). Sponsorships are available. A public reception will be Sunday, September 27 from 1pm to 4pm. Turner House is located at 401 N. Rosemont. Turner House has been hosting art exhibits for more than 80 years, including recent exhibits highlighting works of The Dallas Nine, Women Artists of the Texas Centennial and works by contemporary Oak Cliff artists. Located in the Winnetka Heights section of Oak Cliff, Turner House promotes the arts, celebrates life events, fosters community connections and preserves history. It is known for its annual Salon Series, celebrating music, art and architecture, as well as free community-focused events such as Movies on the Lawn. The organization received the 2013 Stewardship Award from Preservation Dallas for its decades-long commitment to historic preservation. For tickets to the Rising Star3 fundraiser, visit http://www.turnerhouse.org. For more information on Turner House and the Oak Cliff Society of Fine Arts, contact thevents@yahoo.com. This entry was posted in Legacy and tagged Legacy, Rising Star 3, Sheryl Anaya, TWU, TWU Photo Nexus. Bookmark the permalink.